LAST WEEK GOOGLE said it was blocking referendum ads. So why are you still seeing campaign ads online? It transpires that although Google had paused all ads related to the referendum, there are other ways for ads to appear through a Google product – its EBDA platform, which involves what’s known as exchange bidding for ads. 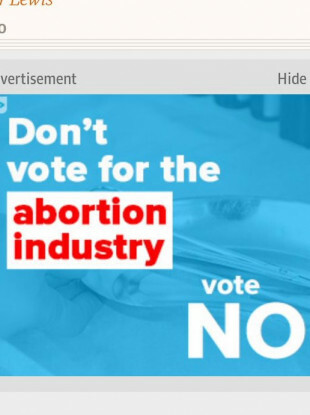 The Transparent Referendum Initiative told TheJournal.ie that it is concerned about the regulation of campaign ads online, and what it means for future referendums. Following our update around election integrity efforts globally, we have decided to pause all ads related to the Irish referendum on the Eighth Amendment. Google made the decision as it was aware of the concerns around the issue of referendum ads appearing online. The enforcement began on 10 May. Although Google has enforced the ban, there are other ways of getting advertisements placed online, through programmatic advertising. This involves the algorithmic purchase and sale of advertising space on websites, in real time. A number of ad exchanges (including Google’s own AdX) and marketplaces enable companies or individuals to bid for ad space, and these ads might then appear on sites that you visit – including news sites. While sites have the ability to filter or block some ads, it is understood that in some cases ads still appeared and their source was difficult to pin down. Once the source is discovered, sites are then able to block the ads. Complicating things is the fact that Google is itself an aggregator of online ad marketplaces, and has its own product called Google Exchange Bidding, or EBDA. Its ban does not apply to all the ads served through EBDA, as the marketplaces using EBDA are not all Google marketplaces. For example, campaign ads were spotted on the Guardian website, and the Transparent Referendum Initiative contacted the publication about this. The Guardian did not know until then that the ads were on its site, and said it “noted that they were unable to ensure referendum related ads did not appear on their site, and that Google had been involved in the distribution of these ads on their site”. The situation is causing concern for the Transparent Referendum Initiative, which was set up to monitor ads run during the campaign. Liz Carolan, who founded the TRI, told TheJournal.ie that the issue raised the question of how ads are classified. She said that this area shouldn’t be left to companies’ discretion. “We thought that when Google made the announcement it was a fair assumption that the ads would decrease,” she said. But she said there have been some pre-roll ads on Facebook videos. Facebook did ban ads – but only those which are funded from outside Ireland. “So really we’re still in the same situation in a way that led to the companies taking this unprecedented decision,” said Carolan. She said that they are highlighting the issue as “we can’t let this be repeated”. Carolan said there is an urgency for reform of the laws around this issue. “This referendum is one which is particularly open to misuse and if anything from our point of view this is a great opportunity.” She said Ireland could “set the template” for how political ads are dealt with, and that “people all over the world are getting in touch with us to see how we’re dealing with it”. Carolan said that one of their concerns is that campaign ads can have no information available to people about their source. “That wouldn’t be allowed with posters or a leaflet,” she said. The TRI said today that “Google’s ban on online advertising did not work”. Unregulated ads have continued and been flagged to the Initiative appearing on international news site, on gaming apps, as video on streaming services, on Spotify, on an academic bibliography generating site. We elect our representatives to make sure these things are done. You don’t elect anyone in Facebook or Google. It’s not their job to make sure. We can’t leave it to them. The Transparent Referendum Initiative is calling for the “lessons from this referendum” to form the basis of new legislation, reforming the Electoral Acts, that extend the restrictions that exist for traditional campaigning to the online campaign. Today, the Transparent Referendum Initiative released its analysis of the use of online ads during the referendum campaign. Since its launch on 14 February, the initiative has captured 1,300 Facebook ads from 280 unique advertisers – and it captured a total of 405 ads in the last week alone. The database is made up of Facebook ads shown to approximately 600 Irish people who have volunteered to share information on ads shown to them, using Who Targets Me. No complete data on the extent of advertising and the amount of money which has been spent, has been shared by the company. It also collected screengrabs of political ads seen on online platforms such as Google, YouTube and others. Groups were found paying for unregulated advertising on videos, websites, news sites, web searches and apps prior to Google withdrawing these services on 9 May. This shows that self-regulation does not work. What we need from these companies is transparency – full disclosure of who has paid them to influence this vote, and how much they have paid. It is then up to our Government to make sure that the rules governing finance in our elections cover digital spending. The Transparent Referendum Initiative partnered with the Geary Institute in University College Dublin to analyse the data collected throughout the campaign. 749 ads (58%) are associated with Repeal and 532 (42%) are on the Retain side. Of the groups not registered or associated with SIPO, 135 (79%) are Irish, 16 (9%) are from advertisers based outside of Ireland, while 21 (12%) are untraceable. “Prior to Facebook banning foreign ads, we were seeing organisations from America, Canada and Britain who were targeting Irish Facebook users to potentially influence their vote on 25 May. Even after the ban, we continue to see ads from anonymous or untraceable pages where we’ve little to no information about who they are or who’s paying for the ads,” said Killian McLoughlin of the Geary Institute at UCD. The Transparent Referendum Initiative said it will continue to monitor the presence of online ads during the final days of the campaign. TheJournal.ie has contacted Google for comment. Email “This is why you're still seeing referendum ads online”. Feedback on “This is why you're still seeing referendum ads online”.